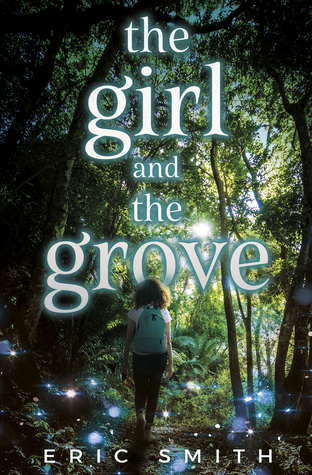 The Girl and the Grove by Eric Smith (eProof) - Teenager Leila’s life is full of challenges. From bouncing around the foster care system to living with seasonal affective disorder, she’s never had an easy road. Leila keeps herself busy with her passion for environmental advocacy, monitoring the Urban Ecovists message board and joining a local environmental club with her best friend Sarika. And now that Leila has finally been adopted, she dares to hope her life will improve. But the voices in Leila’s head are growing louder by the day. Ignoring them isn’t working anymore. Something calls out to her from the grove at Fairmount Park. From Goodreads. I received this eProof for free from Flux via NetGalley for the purposes of providing an honest review. Trigger Warning: This book features racism. When I read that the main character from The Girl and the Grove by Eric Smith, Leila, has seasonal affective disorder, I desperately wanted to read it. But sadly, this book just wasn't for me. Leila has recently been adopted, and is struggling to come to believe that this is her life now, that she won't end up back in the group home. She also has seasonal affective disorder (SAD), a mental illness that has been too difficult for previous foster parents to deal with. And then there are the voices she's heard in her head all her life, that no-one but her best friend Sarika knows about, which have been growing louder and clearer. To distract herself from her worries, she throws herself into her passion for saving the environment. She and her best friend Sarika join the local environment club, and during a field trip to Fairmount Park, and she's drawn to a certain area. After exploring with Park Ranger Langdon, and following the voices only she can hear, Leila discovers something in the grove of Fairmount Park, days before everything in the grove is meant to be flattened; the trees, the nearby derelict mansion, and the mansion's gardens that lead to the grove. Leila quickly becomes determined to save the grove, and save what she's found their - because if the grove is torn apart, then Philadelphia will be in jeopardy. The Girl and the Grove is by no means a bad book. The problem is me rather than the book; it heavily focuses on saving the planet, which is important and something I'm interested in, in general, but not something I enjoy reading about in fiction, I have now discovered. So it's just down to personal taste here. The description above clearly states that Leila is into environmental advocacy, that she monitors message boards and joins and environmental club, but I thought they were just hobbies, things we would read about, sure, but I didn't realise the whole point of the book was going to be based around environmental activism. This is a fantasy book, but the fantasy elements are quite small. It's difficult to talk about without spoiling the story. However, we don't really see that The Girl and the Grove is a fantasy until just before 50% into the book. I felt it was quite slow to get going, and, considering the title, quite a while before Leila discovered the grove. Despite being slow, and being about something I now know is not my cup of tea, the writing kept me reading. It's written in such a way that I was interested in the story, even though I wasn't interested in the topic. Most chapters end on mini cliffhangers, and I always wanted to know where the story was going next, and the more I read, the more questions I had. But once we discovered what was in the grove, the focus switched to saving the grove, rather than on what was in the grove itself. We get very few answers to the questions that pile up. In the great scheme of things, not much time is spent with what's in the grove, so we find out very little. This looks to be a stand alone novel, so I don't think I'm going to find out any of the answers, which is a little frustrating. I loved how the story dealt with adoption and fostering. It should also be noted that Smith was himself adopted, which I knew before reading having previously read the article, and so this part of Leila's story felt especially poignant. Leila really struggles with accepting she's now been adopted. Time and time again, she's been let down by foster carers and potential adoptive parents who always sent her back to the group home, partly down to her having SAD. So, understandably, despite actually being adopted now, she's worried it's going to happen again. She calls her parents by their names, Jon and Liz, rather than mom and dad, and she tries not be too much trouble. At one point, during a conversation about a willow tree in their garden that has been struck by lightning - damaged beyond repair, needing to be torn down - Leila feels they're giving up on the tree, and gets anxious that that's how they'll feel about her, and because of the emotional turmoil, accidentally cuts her hand badly enough to need stitches. Her parents want to take her to the hospital, but she misunderstands and thinks they want to take her back to the home, and panics. It's a heartbreaking scene, as, in tears, she practically begs to stay at home, saying it won't happen again, saying she'll just bandage it and will be fine. It's so upsetting. It's really emotional but also so beautiful to see her realise, over the course of the story, that Jon and Liz don't want her to go anywhere, that this is it for her now. They are her parents, and this is her home. I also loved how it covered the stupid questions people would ask about her being adopted and her biological parents. I was completely dumbfounded that anyone would be that ignorant not to know you just don't ask. My Nan was a foster carer, so I grew up knowing lots of foster children, so perhaps that's why it seems so obvious to me, as I was brought up not to ask. But come on; you don't know anything about the past of a person in foster care, or who has been adopted. In Leila's case, she doesn't know her biological parents, but no-one asking the questions knows that, they have no idea what she may have been through that led to her going into foster care. You don't ask about things that could be painful and upsetting, or even triggering. You just don't. You wait to be told, or you never know. It's none of your business. So it just made me so mad whenever it happened. The Girl and the Grove is the first book I've ever come across that features a character with seasonal affective disorder, which is why I wanted to read it so much. What's great about it is, it's not about Leila having SAD - this isn't a book about mental illness, it's about a girl who's trying to save a grove, who has a mental illness. We don't find out too much about it; we know Leila can feel depressed, she takes medication, and has to use a therapeutic light box for fifteen minutes each morning - which we see each morning at breakfast. We know foster parents in the past didn't really get it, and would ask questions about how she was feeling depending on what the weather was like, even though the weather had nothing to do with it. But we're not really told what it means. We see Leila experience anxiety and at least one panic attack, and she mentions that she has depression, but there's never a "I have SAD, and this is what that means," moment. But that seems realistic for me, because she's already adopted, so her parents already know, as does her best mate, and it's no-one else's business, so there's no reason to explain it to a person, and she's not going to randomly "think" about what SAD is as part of her narration to explain it to the reader. And as it's not a story about Leila having SAD, I think it would seem weird and clunky, to have her explain it when it's not a major part of the story. If the reader doesn't know what SAD is, the reader just has to look it up. Yes, that means more work for the reader, and that may be frustrating, but it's not Leila's job - or any real person with a mental illness's job - to explain and educate about their mental illness. And those with SAD who are reading this book? They don't need an explanation, they know what it is. This is about representation, so teens with SAD can see themselves in a book, not about educating everyone else. And speaking of representation, it was great to see the various marginalised characters in this book. As well as having SAD, Leila is also black, which is important as I've found only a few YA novels featuring mental illness where the protagonist is also a person of colour. It's not just white people who have mental illnesses, but from looking at YA books, you would think it was - or at least rarer for people of colour to have mental illnesses. Leila has also been adopted by interracial parents, with Liz being black and Jon being white. Sarika is South Asian - and, sadly, experiences racist bullying, and has a racist slur used against South Asian people hurled at her. As I said, The Girl and the Grove isn't for me, but that doesn't mean it's a bad book. The writing is captivating, and the adoption side of things is so beautiful. It was just a mismatch with me on the environment/conservation side of things. Do read more reviews before deciding whether or not you'll read this book. Thank you to Flux via NetGalley for the eProof.